Hello American readers, I hope you have all voted or plan to vote later in the mid-term election! Your vote counts! WARNING! We definitely ordered FAR TOO MUCH FOOD! We knew we did, but we wanted to have a ton of leftovers for the week ahead. 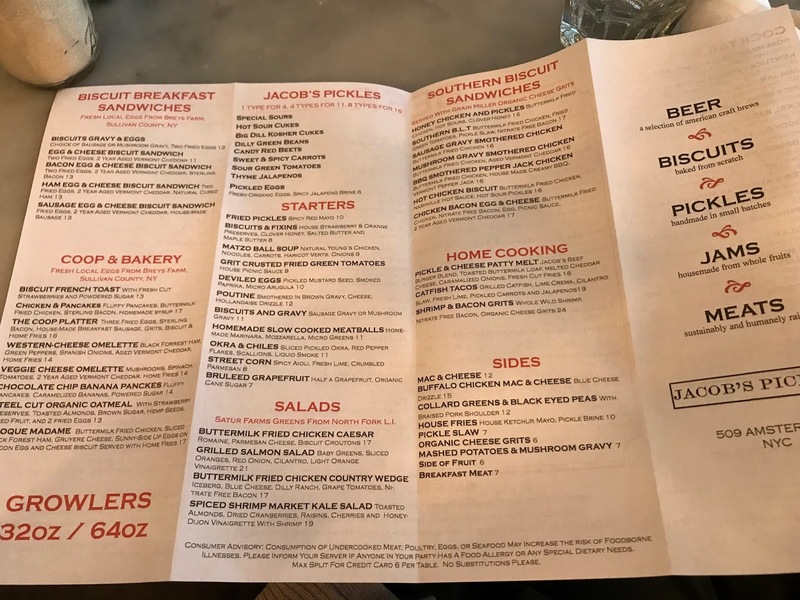 Jacob's Pickles is THE place to go for fried chicken and biscuits (and pickles, obviously). 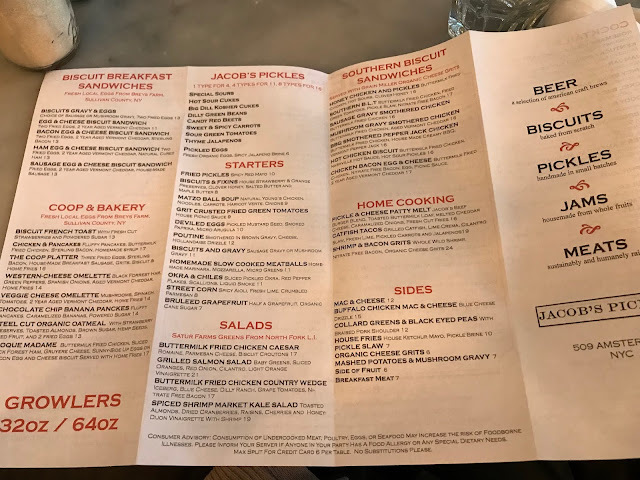 (Maison Pickle is for French dip sandwiches and French toast). 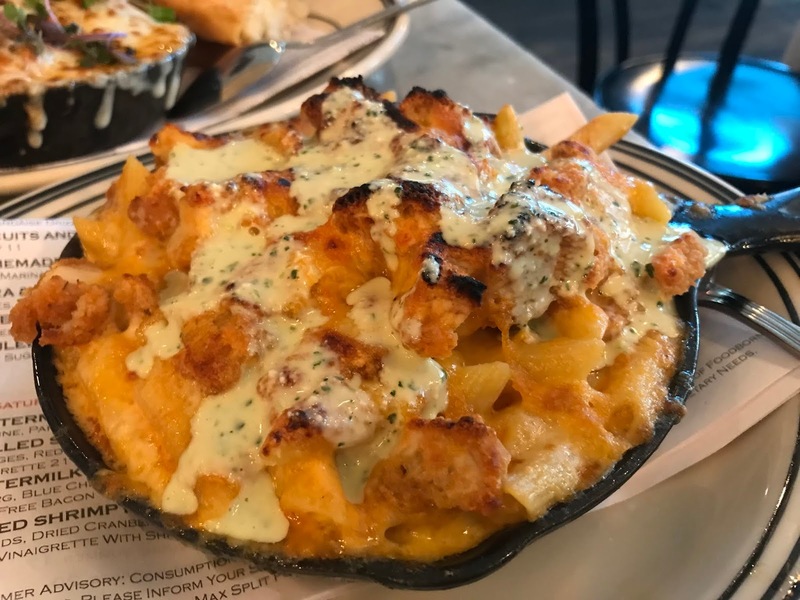 Whenever we go to either Maison Pickle or Jacob's Pickles, we have to get the Buffalo Chicken Mac and Cheese. It's one of the most famous food options at Jacob's Pickles (or Maison Pickle). It's SUPER cheesy, but then has buffalo sauce-covered fried chicken pieces and bleu cheese dressing on top. This is so cheesy. So, I definitely cannot partake in enjoying it, but I have taken a nibble here and there and it's definitely worth the potential tummyache. We also got this slow cooked meatballs. It was the first time we tried it and it was a medium hit. It was good, but we had other favorites that we would prefer eating. 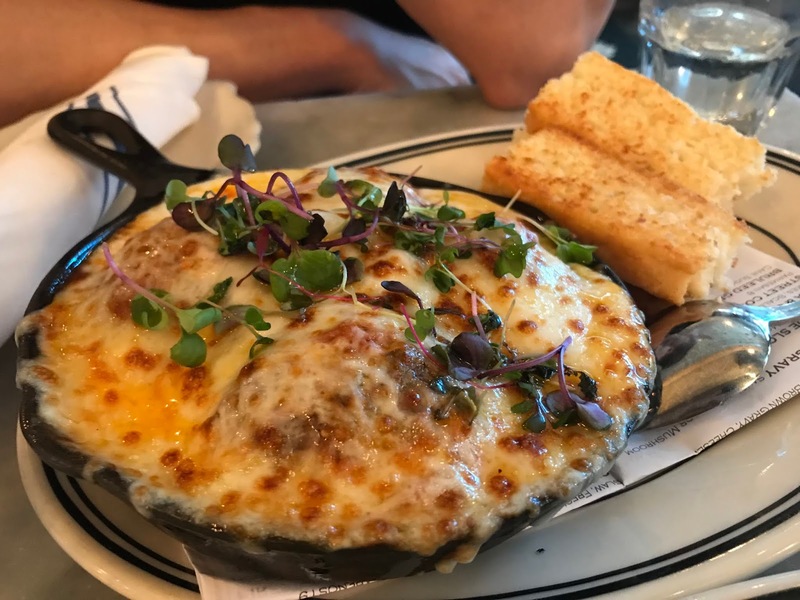 The meatballs were very savory and fluffy, for lack of a better word offhand. The sauce was slightly sweeter than I prefer, I prefer a garlicky, spicy sauce. 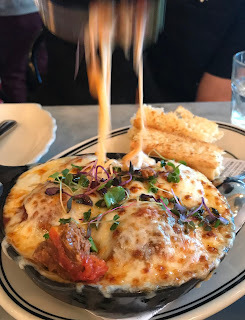 However, it was wonderful with the bread. 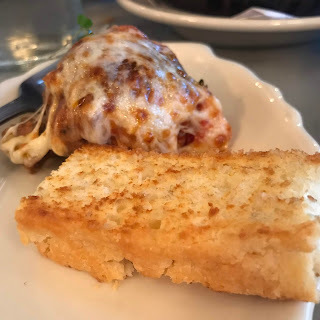 The perfect bite is a small piece of meatball, some cheese, sauce, and bread all together. 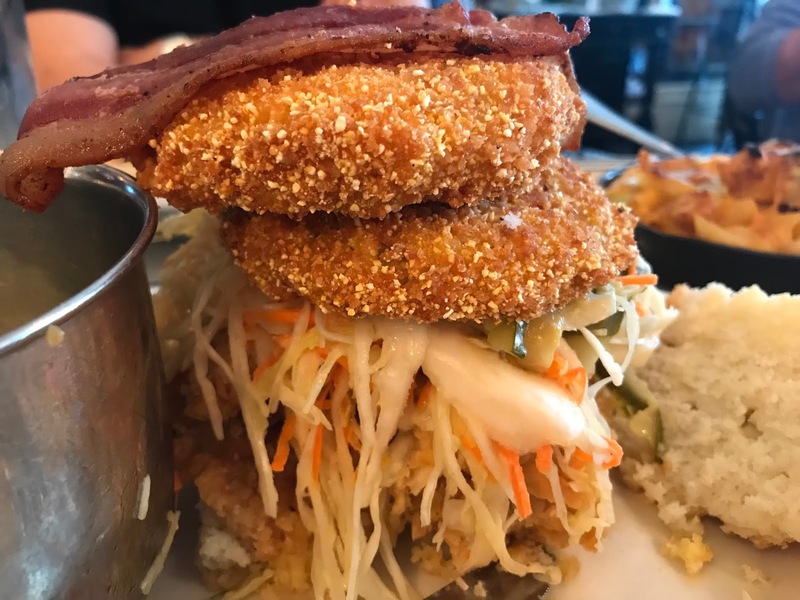 This is the Southern BLT. It's fried chicken on top of the famous biscuits. 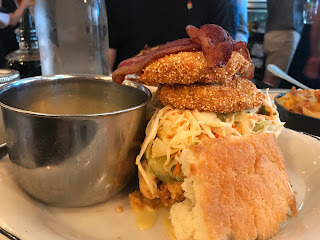 Additionally, on top of the fried chicken you'll find a hearty amount of cole slaw, two slices of fried green tomatoes (also a great appetizer if you like fried green tomatoes), and two slices of bacon. Look at the monstrous portion! It's definitely enough for a family to share. Or, just one person over the course of three or four days. Aerial view of the sandwich. 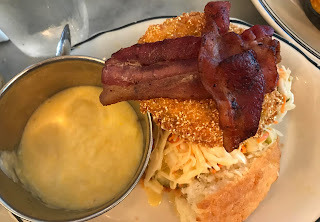 It's also served with a hearty portion of cheesy grits. This is the Chicken and Pancakes. Look at the monstrous portion on this beast, too. It's so cheap when you think about it. It's $17. 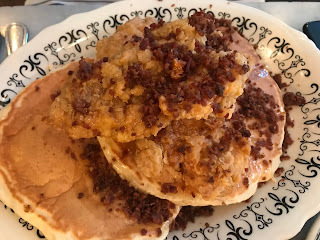 Believe me, if you tried to lift this plate, you may need to do some exercises first. 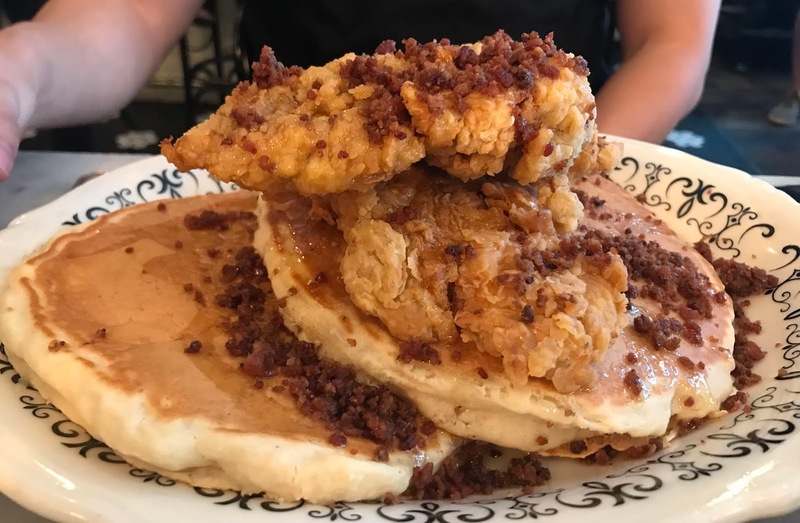 It's a generous stack of pancakes topped with two large fried chicken breasts and then finished off with bacon crumbles. 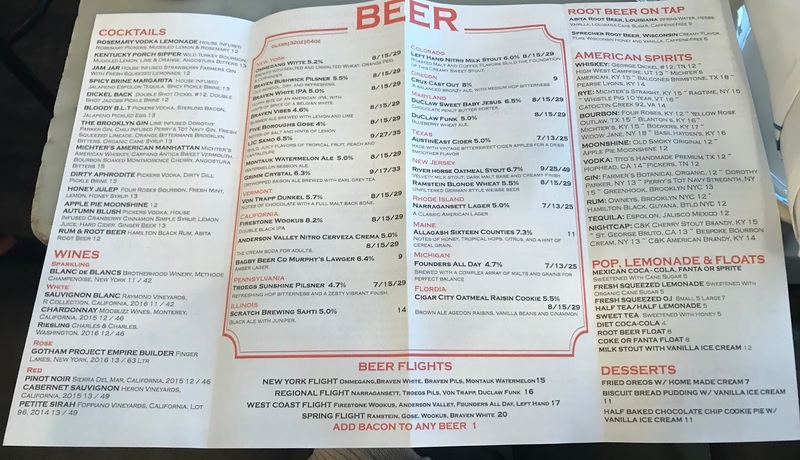 This is the brunch menu (drink menu follows).